Wake up to this breathtaking view every morning! This photo was taken from our 5th floor balcony! Our two bedroom, two bath condominiums, are located behind Paradise Village Mall at the entrance to Paradise Village Resort. 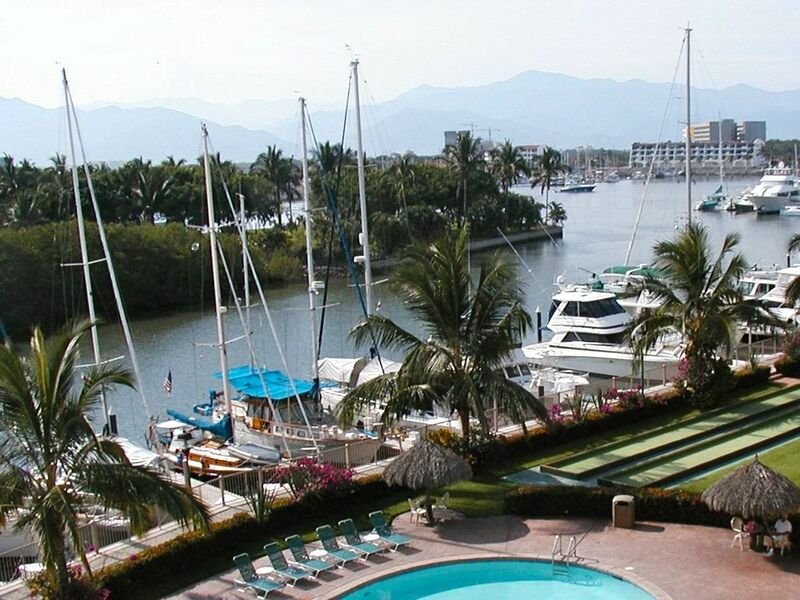 Our privately owned area is known as MARINA RESIDENCE CONDOMINIUMS or M.R. WE HAVE 2 CONDO'S... #5515 is located on the 5th floor and #5415 is on the 4th floor. One on top of the other with the stairs conveniently located just outside the front door for quick access to each other if you ever need to rent both units for family or friends. Our corner units are in the building which overlook the beautiful pool and Marina. Corner units are great, with only one neighbor, and we have extra windows in our living room which allow for a better view and more light. The elevator is right outside both front doors for a quick ride down to the pool. Rent one or both units when available. You can lounge around our beautiful Marina Residence pool, where it is quiet and secluded, or take an 8 - 10 minute walk to Playa Royal Beach Club. Shuttle service is also provided every 30 minutes to and from the Beach Club and Racquet Club. The Playa Royal Beach Club has a beautiful pool, hot tub, pool lounge chairs, small private palapa's on the beach with beach lounge chairs, beach towels are provided, food and drink service at pool and beach, childrens pool and play area, locker room for showers, steam room, and sauna. Also available is the Racquet Club Gym and Spa, where you will find two more lovely pools, work out equipment, trainers, tennis courts, a gymnasium, shuffle board, bocce ball, and pickle ball courts. This facility is located on the El Tigre Golf Course. The Paradise Village shuttle makes a complete run through all of Paradise Village facilities every 1/2 hour for your convenience. You can spend an entire day at these facilities and never get bored. There is a small weekly fee of approximately $17.00 USD per person for use of both facilities, paid directly to the Resort. The best thing about our location is the mall, which is right next door to our Condo's and so convenient. Walk down our lovely cobblestone drive and in the back door of the mall and you will find a grocery store, clothing stores, retail shops, Dominoes, McDonald's, Baskin and Robbins, several Restaurants, a Jewelry store, Deli's, a Bank, etc. This luxury is just 1 minute from our front door. For evening entertainment, you should try a Theme Dinner at Paradise Village Resort. You can purchase tickets for these at any of the Kiosks located in the Mall or entrance to Paradise Village Resort. The Mexican Fiesta and Western Night are our Family favorites. A buffet dinner, all your drinks, and a full night of entertainment. Also, check out the tour to Yalapa! This is a full day of fun on the ocean and in the jungle. You will snorkle, ride a horse through the jungle to a beautiful waterfall, and have lunch on the beach. This tour leaves right from our Marina at Paradise Village. The bus system is convenient for travel into Puerto Vallarta. Large comfortable buses leave from in front of Paradise Village mall every 20 minutes to downtown Puerto Vallarta. We keep our units very clean and supply every convenience necessary to help make your vacation getaway feel like home. We have no doubt that this could be a perfect TEN in your Vacation experiences! Part of the Paradise Village Resort. Guests have access to the Playa Royal Beach Club, El Tigre Sport and Racquet Club. Thank you so much for a lovely stay. We liked the area so much. The Condo was great and updated. Loved looking over the balcony to view the pool and marina. Hope to come back soon. Chris: Your beautiful condo is truly our home away from home. Everything is perfect. We love how quiet it is and listening to and watching the beautiful birds. We love watching the sunrise every morning and the boats coming and going in the marina. Your condo is equipped with everything one could desire and your decor is gorgeous. We are already counting the days until we return once again in 2016. Hi, we want to thank you a lot, for the incredible vacation we had, we really enjoy your condo and the magnificent service they have there, they treat us very nice, and we hope we can rent your condo again. This has quickly become our favorite place in the world (outside of our own Montana paradise). The resort leaves nothing to be desired. It is perfection. And Chris, you have done a wonderful job appointing your condos with so many thoughtful comforts and such beautiful decor. I'm torn between keeping it a secret & telling the whole world! But it would be a shame to keep this a secret!!! Thank you so much for sharing this beautiful paradise with us. We hope to visit every year. Hi Chris ! This is my first day back to work. Arrived back to BC Saturday night. We had a wonderful time ! One week is too short ! Thank you so much. I will highly recommend your suite to anyone. There is a bunch of us turning 50yr next yr & we want to talk them into going there. Some want to go to Los Cabos. The resort is very nicely kept and I think one of the best offered. (Paradise Village). Your condo fit us all nicely & as you said --- the location was perfect. Close to the elevator , on a corner suite & over looking the pool & Marina. Our bed was very comfortable & the on-suite bath was huge ! It was a very good way of going. The restaurants were good also. We made breakfast in the morning but ate out the remainder of the time. (we ordered in Pizza twice). We used the condo pool as well as the resort pools. The condo pool was like our own private pool as no one was there & the grandson liked it best. Unfortunally the ocean was red flagged for 3 of our days so they would not give out the boogie boards. But the days that we used them , they had a lot of fun. We listened to you & took the boat over to Yalapa. We rented the horses as well. It was one of our best days. Everyone had a great time. Unfortunally the Zip Lines ( Canopy Tour) was booked by the Tuesday and we were unable to go on it. ( next time) We took the bus into town twice & spent time looking through the shops and seeing the real life of Mexico. That in itself was an experience. We were busy each day & really spent little time inside the condo but thought it was a wonderful place. Thanks again & I will give it raving reviews......... I will keep your name for sure ! Thanks...... Linda , Butch & family ! Dreaming of the 'Big Catch'. Fishing trips can be arranged through Marla's Sport Fishing. Ask for Danny! They'll pick you up right at our Marina. Welcome to the World Class Tuna Fishing in Puerto Vallarta. This property is better suited for couples and small family's.